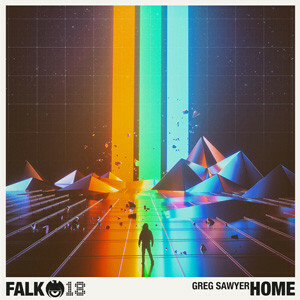 Continuing where ‘Whenever I Try To Leave’ left off, Greg Sawyer takes it up a notch with ‘Home’, three tracks of deep melodic house with a slightly tougher vibe this time, aimed squarely at the deeper end of clubbing. Title track ‘Home’ is a slow building deep house number, driven by a strong melodic synth theme, warped vocal cuts and an intense breakdown. ‘Caedmon’ follows with a slightly more esoteric vibe of spacious delayed rhythms and throbbing basslines under Moby-esque cinematic strings and repeating light vocal phrases. Closing track ‘Misunderstood’ pulls you deeper into the void as mechanic-organic rhythms pound under wave after wave of drones, dense reverb, hinted piano melodies and tripped out vocal cuts. Check it out below, it’s out 29 February on Falk.